I recently finished reading the seminal leadership book, The Score Takes Care of Itself, by Bill Walsh, the legendary 49ers Head Coach. In 1979 when Walsh took over the 49ers, the franchise was the laughing stock of the NFL as it managed to win only two games that season. However, in less than two years, Walsh led the 49ers from last place to Super Bowl Champs. A true Cinderella story. When Walsh left the franchise ten years later, the team had won three Super Bowl Championships and completed perhaps the greatest run in NFL history. How did Walsh fuel this transformation and build one of the great NFL dynasties? He credited his “Standards of Performance” as the catalyst for driving organizational change and maintaining a high level of performance during his tenure with the team. Walsh codified his “Standards of Performance” and drove them throughout every level of the organization including the administrative staff. Within the first year, there was a dramatic shift in the way that everyone approached and performed their jobs. Nothing short of excellence and a team first attitude would be tolerated. Coach Walsh’s standards and values clearly set the tone for the organization. It’s a huge reason why The 49ers organization went from worst place to Super Bowl Champs. As the title of the book suggests, Bill and the team weren’t focused on the score at the end of the game but rather all the things that happen leading up to the game and behind the scenes. Treating teammates with respect. Putting in an extra hour in the weight room. Answering the phone with professionalism. Perfecting technique. Studying film. Dressing appropriately. There are hundreds of examples. 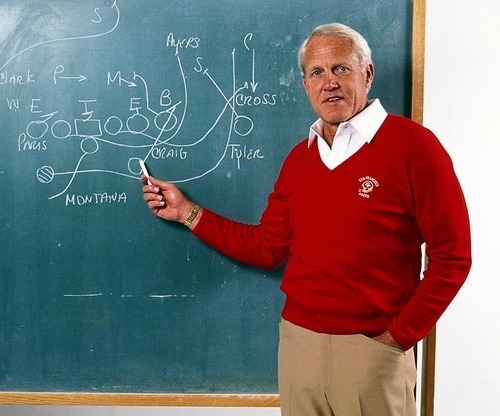 As my former partner, Ben Lerer, once said to me, “It’s not about the light at the end of the tunnel…it’s about the tunnel.” The 49ers under Bill Walsh embodied this mindset. I fundamentally believe that entrepreneurs and executives should go through an exercise to develop your own set of standards and values to drive and guide the organization. These should come from you but it’s important to seek input from your team as well as steal ones from companies and leaders you respect. Write them down. Share them with your team. Rinse and repeat until you’re comfortable with the list. Remember, Bill Walsh perfected his over a thirty year career so don’t expect to get it right the first time. As the organization grows and scales the list will likely change so keep an open mind. I’m encouraging RRE to rethink what drives our venture firm. Additionally, I’ve purchased copies for every founder I have backed and everyone at RRE. The hope is to fuel thought and discussion at the companies I’m closest to. That said, what are some startups you admire that have developed their own standards of performance and values? I’d love to hear your thoughts and suggestions.